The French may have had a better chance at the Battle of Agincourt had they not been weighed down by heavy body armour, say researchers. A study published today in Proceedings of the Royal Society B shows that soldiers carrying armour in Medieval times would have been using more than twice the amount of energy had they not been wearing it. This is the first clear experimental evidence of the limitations of wearing Medieval armour on a soldier's performance. During warfare in the 15th century, soldiers wore steel plate armour, typically weighing 30-50kg. It is thought this may have been a contributing factor in whether an army won or lost a battle. "We found that carrying this kind of load spread across the body requires a lot more energy than carrying the same weight in a backpack," says lead researcher, Dr Graham Askew from the University of Leeds Faculty of Biological Sciences. "This is because, in a suit of armour, the limbs are loaded with weight, which means it takes more effort to swing them with each stride. If you're wearing a backpack, the weight is all in one place and swinging the limbs is easier." The research team included academics from the Universities of Leeds, Milan and Auckland along with experts from the Royal Armouries in Leeds, UK. 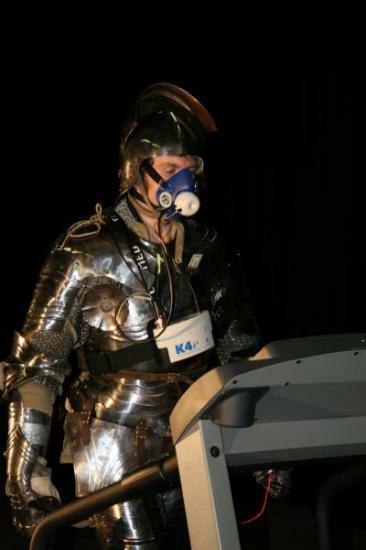 Researchers worked with highly skilled fight interpreters from the Royal Armouries Museum, who wore exact replicas of four different types of European armour. They undertook a range of walking and running exercises, during which their oxygen usage was measured through respirometry masks, providing researchers with a picture of how much energy was being used by the participants. The study also showed that the armour had a clear impact on the soldier's breathing. Rather than taking deep breaths when they were exerting themselves - as they would have done had they not been wearing armour - the interpreters took a greater number of shallower breaths. "Being wrapped in a tight shell of armour may have made soldiers feel safe," says co-investigator Dr Federico Formenti from the University of Auckland. "But you feel breathless as soon as you begin to move around in Medieval armour and this would likely limit a soldier's resistance to fight."